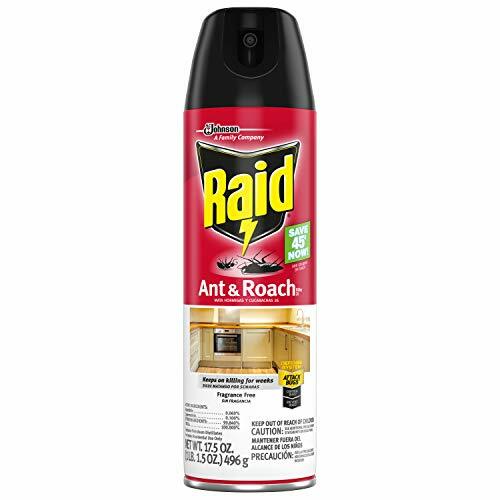 A simple fix to an irritating problem, Raid’s Ant and Roach Spray is effective and easy to use. Aside from the sporadic comments about issues with the can’s manufacturing and the fact that you have to chase down your insects sometimes, this is a solid bug spray. We give it a 4.5/5. A trusted household name, Raid has produced another product that has pleased its loyal customers. Easy to use and with the bonus of no bad smelling chemicals, this spray has proven itself to be effective and simple. We give it a 4.8/5. These little tubes may not look like much, but the gel gets the job done. With just a few drops of this stuff, ants will be attracted and killed within days. This highly effective product gets a 4.8/5 rating from us. As one of the most well-known insecticide brands, Raid’s products attack more than just ants. They prevent and control as well. The brand’s product listing is vast a versatile, eliminating roaches, spiders, bed bugs, fleas, and more. Ant problems sometimes require tough solutions. With the company’s success at a high level, it’s a good idea to look into their top products for ant infestations. Does not damage wooden surfaces. Has a lemon scent rather than a harsh chemical smell. Versatile; capable of killing many different bugs. Users report messiness with the spray can. 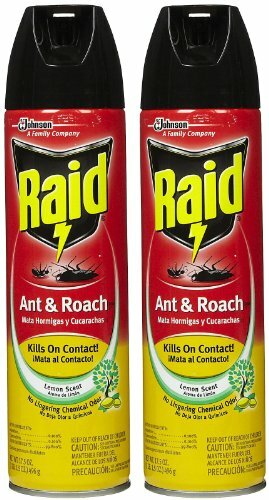 Raid’s Ant and Roach Killer Spray is made to kill both ants and roaches on contact. With an easy to use can, all you have to do is point and spray to kill these bugs in and around your home. The spray will stay effective for up to four weeks once you have sprayed it somewhere. This ensures that you have lasting protection in your home for other ants and roaches that you missed. Spray this insecticide around cracks and crevices where bugs may be able to get in. Not only will this provide a protective barrier, but it will kill the ants that come in contact with it. This spray is also effective against waterbugs, silverfish, spiders, and beetles. Does not leave an unpleasant scent after use. Long lasting ingredients gives long-term protection. Does not harm the ozone. Will not harm wooden surfaces. Many ant and insect sprays are highly effective, but they tend to leave a nasty chemical spray behind. While some cover that up with scents, Raid has developed an unscented spray that eliminates the smell problem altogether. This ant and roach spray kills on contact. Whenever you see ants or roaches, you just spray this product, and they’ll be killed. Like the scented version of this spray, the unscented version acts as a preventative measure as well, keeping bugs away up to four weeks after you have sprayed it. Additionally, this product does not contain any harmful chemicals that are known to deplete the ozone. Easy to use and hassle-free. Attracts all common household ants. Sweet taste disguises the poison in the bait. Attacks the entire colony, not just the ants you see. Is not safe to use around pets or children. Will not attract fire ants. The Precision Placement Ant Gel from Raid is a bait rather than a contact killer. What this means is that once you have placed this bait, the ants in your home will be attracted to it. The poison found in the bait is slow-acting, meaning that once the ants eat it, they’ll live long enough to bring it back to their colony. During this process, more ants from the colony will come back to their bait, and the poison will spread to the rest of the colony members. Eventually, a small amount of this gel can kill an entire colony and its queen. Easy to use, all you have to do is point and squeeze. The gel will do the rest on its own. Highly effective formula kills ants along with spiders and roaches. Long lasting for up to two months. Fog penetrates small and hard to reach places. Fog can be used to bomb entire rooms. Can be harmful when inhaled or in contact with the eyes. While the Concentrated Deep Reach Fogger may look similar to contact sprays, it’s a little different in that rather than shooting a stream or spritz of the product; it forms more of a fog—hence its name, fogger. This product is often used for what is referred to as “bombing” rooms or areas. Basically, you can use this product to target an entire room. 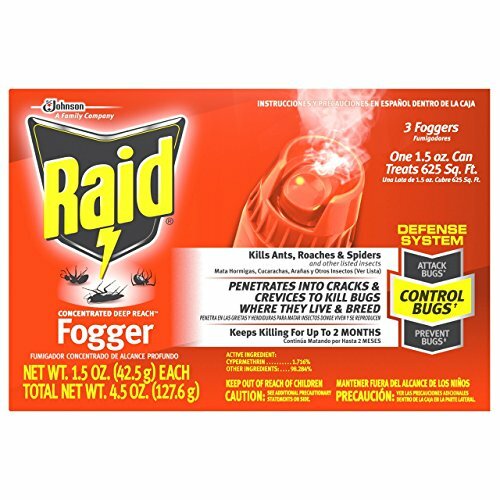 Spray and fog up an entire room to kill any ants or other insects living in there. The fog will reach all the cracks and crevices other products can’t find where ants, spiders, and roaches may be hiding. Not only will this formula kill without leaving a mess or stains, but it will keep working for up to two months. After bombing a room, it is best to stay out of it for eight to ten hours. The product can cause harm and irritation and isn’t good to inhale. Effective spray instantly kills a variety of bugs. Long-lasting formula keeps working for up to 12 months. Battery operated nozzle gives you a continuous stream. Surfaces are sticky after being sprayed. Comes in a pack of 1, 2, 3, 6 or 12. 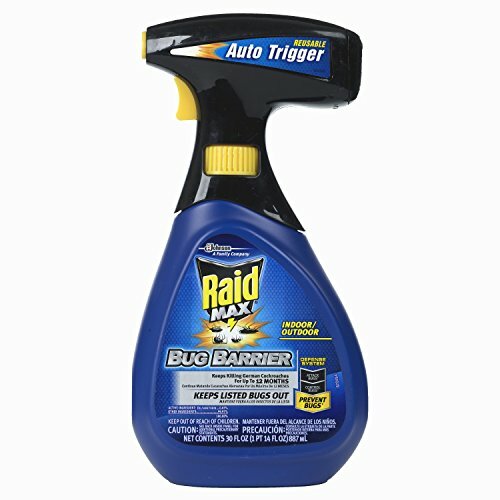 The Raid Max Bug Barrier is Raid’s longest lasting defense against bugs. The unique nozzle on this product is battery-powered for continuous spraying. The steady stream lets you create a barrier to defend your home from a variety of bugs. Killing several different kinds of bugs, the Max Bug Barrier will continue killing and defending for up to 12 months. It can be used in both indoor and outdoor areas, creating a sticky surface that deters and kills bugs. The spray is virtually odorless and is very easy to use. It will not stain hardwood surfaces, either. It is safe to use around pets, but a warning from the company states it is toxic to fish and aquatic life. It can also irritate your skin if you come in contact with it. SC Johnson has developed several Raid products that have become very popular in the homes of America. Raid is a product line from SC Johnson, which is a family company that has been around since 1886. Its strong reputation represents trust and loyalty. With several of their product lines becoming household names, it’s easy to see their success. SC Johnson has developed several Raid products that have become very popular in the homes of America. Their pest control system extends from ants, spiders, and roaches to bed bugs, fleas, and even scorpions. Raid’s products come in various forms such as sprays, traps, gels, and foggers, but they all have the same goal: to eliminate pests. It is surprisingly easy to an ant infestation to begin. All it takes is a small crack in the baseboard of your kitchen or a crooked window frame. Ants are so tiny that you may not even notice these crevices until it is too late. The ants you see in your home are most likely worker ants. These ants are the ones who go searching for food sources. A home is an excellent source of food. It is so easy for ants to get in and find crumbs, spills, or open containers of food. Once they have found these things, they go back and tell the rest of their colony. When that happens, it is likely that more and more ants will come back into your home. It doesn’t take long for a small ant problem to become a large ant problem. Another cause of ant infestations is rotten wood, which is not common knowledge. Ants love rotten wood because it’s easy for them to build their nests in. When wood becomes saturated, it rots and gets softer. This can happen in homes due to leaky pipes or sewage issues. General home maintenance can help to reduce your chances of having ants in your home. Maintaining a clean kitchen is a huge help, and ensuring your pipes are in working condition can help as well. Make sure you don’t have any rotten trees or lumber on your property, either. If for some reason the products above don’t seem to suit your needs, there are many other Raid products that are excellent for attacking ant problems. For example, some people don’t like to use the ant gel because it can be messier. Raid has ant bait that comes in the form of a plastic station. The bait is inside the station, and the station itself has little holes where the ants can get in. Rather than placing the gel directly on your countertops, you can just place the stations. If you are looking for some more heavy duty, lengthy protection, you can try Raid’s Max Bug Barrier. Targeting a variety of insects, this spray kills and keeps killing for up to 12 months. It can be used inside and outside and is the longest lasting defense Raid has. For tough to reach areas, you may want to go for the Raid Max Ant and Roach. Similar to other contact sprays, this product kills fast and easily. The bonus here is that the spray comes with an extension piece that allows you to reach even the smallest crevices.